Crude oil prices gained traction on Friday and rallied to their highest level since July to reach the $73.7 mark. The weekly report published by Baker Hughes energy services revealed that the total number of active oil rigs in the United States declined to 863 to provide a late boost to the WTI. On top of that, Saudi ARAMCO announced that it would boost its oil output by 600K barrels per day to make up for the negative impact of the U.S. sanctions on Iran's supply. “The market is coming to grips with the fact that the Iranian sanctions are not that far away. It’s going to tighten the market,” Phil Flynn, an analyst at Price Futures Group in Chicago, told Reuters on Friday. After three days of tight consolidation, prices finally gained momentum and surged above the $73 level as expected. The price is currently still holding above this area and hovering just below the $73.5 resistance level. 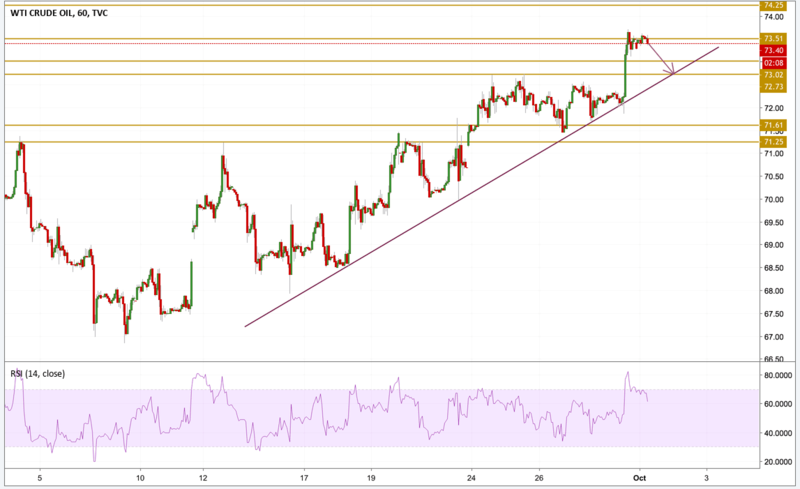 The RSI is showing a recovery for the momentum from overbought conditions and a divergence with the price, so a retest of $72.73 per barrel is more likely to happen before we can see another rally in the prices.